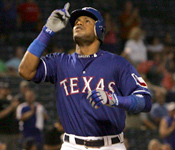 After a one year hiatus from baseball in 2006, Sammy Sosa returned to his first team - The Texas Rangers - for what turned out to be a farewell tour...as well as his chance to gain entry into the ultra-exclusive 600 Home Run Club. The results were everything he - and his millions of fans worldwide - had hoped for: 21 home runs during the 2007 season, enabling him to victoriously crash through the 600 homer plateau and finish what will undoubtedly be a Hall-Of-Fame career with 609 long balls. 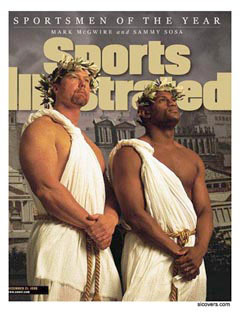 During his 1998 neck-and-neck battle with Mark McGwire for the major league single-season home run record. it was impossible to determine whether Sammy Sosa was a bigger star in his native Dominican Republic or his adopted hometown Chicago. Still struggling with the “low attendance hangover” from the mid-90’s baseball strike, baseball needed something to ignite the fan base into returning to major league ballparks. That “something” turned out to be Sosa’s colorful personality, dynamic batting style and winning smile, which made him a household name. Although he ended the ‘98 season second to McGwire with 66 home runs — it was still five more than the previous record and more than enough to cement Sosa’s place as one of history’s most dynamic home run hitters. 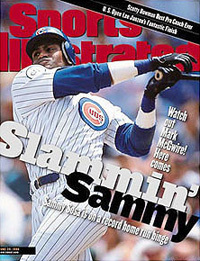 In 1993, Sosa became the first player in Cubs' history to both hit more than 30 home runs (33) and steal more than 30 bases (36). A player's strike cut short the 1994 season, but Sosa still hit 36 home runs (second in the National League), drove in 119 runs (second in the National League), stole 34 bases (seventh in the National League), and made his first All-Star Game appearance. Despite his achievements, Sosa never stopped working to improve his game. Before the 1998 season, Sosa heeded baseball critics by working with Cubs’ hitting coach Jeff Pentland to slow down his swing; thereby cutting down on his strikeouts and hitting more to the opposite field. Armed with an improved swing and new attitude, Sosa put together one of the most remarkable months in major league history. From May 25 through June 21, he hit 21 home runs in 22 games. Then, in a game against the Detroit Tigers, Sosa broke the major league record for home runs in a month when he hit his 19th and 20th homers during June. "Sammy’s achievements are legendary, but more importantly he has handled himself with a class and dignity that has been unparalleled," said Baseball Commissioner Bud Selig. • The Cubs' star became the first non-American born and first non-white player to hit 60 or more home runs in a season. • Sosa’s hometown of San Pedro de Macoris in the Dominican Republic has produced several major league players, including George Bell, Pedro Guererro, and Tony Fernandez. • When he came to the United States for the first time, in the spring of 1986, Sosa did not know how to speak English. • During his first full major league season (1990) Sosa was the only American Leaguer to reach double figures in doubles (26), triples (10), home runs and stolen bases. "We knew he was very good," White Sox general manager Larry Himes said. "We didn't know it would come so quickly."